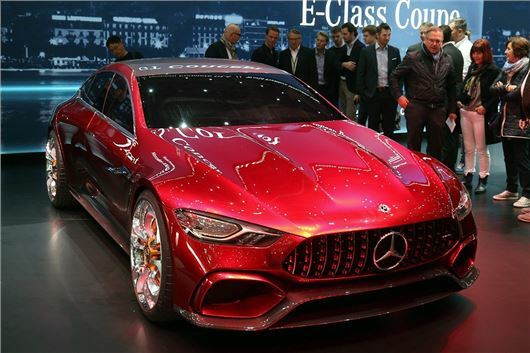 Mercedes-Benz has revealed the Mercedes-AMG GT Concept at the 2017 Geneva Motor Show. The four-door performance coupe is set to go sale as a rival to the Porsche Panamera, probably in 2018. Price is to be confirmed, but expect to pay from around £70,000. Power comes from a twin-turbo V8 engine paired to an electric motor, together driving all four wheels. The power output is 805PS in the concept, meaning 0—62mph is takes less than three seconds. Chances are the production car will have a saner power output though. Marginally. But it’s not all about performance. The electric motor can drive the car without the help of the engine over short distances, so fuel economy is likely to be half decent around town – though the pure EV range hasn’t been announced. The styling takes plenty of cues from the existing AMG-GT Coupe, with slim, wide tail lights, twin bonnet bulges and a big, bold grille. The concept has no door mirrors and ornate, huge alloy wheels that aren’t likely to make it to the production car, but it is otherwise almost certain to look like the concept. Mercedes-Benz has used that old concept car trick of entirely blacking out the windows – so they haven’t finished the cabin yet. But there’s going to be a decent boot and seating for four, or maybe five if we’re lucky. Expect all the usual modern gadgets too, like semi-autonomous motorway driving, smartphone connectivity and fancy LED headlights.